The original The Bigfoot Geo-Trail 2019 showcases new locations where Bigfoot has explored. A numbered wooden geo-coin with Bigfoot artwork is awarded with completion. 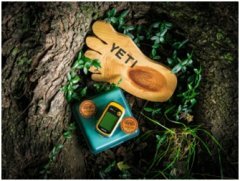 Completing the Bigfoot geo-trail will allow you to submit your paperwork to our office to be enter a grand prize drawing for a FREE GPS Unit. Office Hours to pick up coins: 9 am to 5 pm, Monday-Friday. Paperwork can also be mailed to the address below to enter contest. We will mail out your coin. Submissions need to be sent to our office before October 31, 2019 to be eligible for the grand prize drawing. Held annually at Allegheny State Park in the state of New York, this annual event attracts participants from around the world. Allegheny State Park, Salamanca, NY. www.aspgeobash.org.